S & A Hodgson Ltd cover the North of England and Scotland. See what our valued customers are saying about our work and business on our testimonials page. 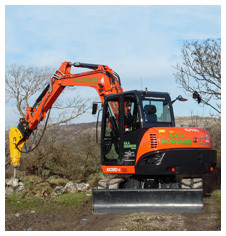 Excavation contractors S & A Hodgson run a fleet of well maintained plant that is available to hire with a CPCS trained operator throughout Cumbria, Lancashire, Scotland and the rest of the North of England. Our plant ranges from 1 - 15 tonne excavators, 3 - 6 tonne site and track dumpers, stump grinders and breakers both excavator driven. Please see the Plant & Services page for more information or contact Andy on 01539 552458 or 07836 782707. Alternatively you can email Andy direct from here. By working with our customers we ensure you experience and a level of quality and assurance throughout the contract. We ensure that health safety and welfare are an integral part of any job, and strive to achieve quality workmanship and a prompt and reliable service. Our machines are ideal for work ranging from landscape preparation to forest road formation, civils and groundworks. We are based in Cumbria covering the North of England, Scotland and the Midlands, For other areas please call Andy on 01539 552458 or 07836 782707 or email us for more information..
Kubota equipment used with Rototilt for specialist excavations. All of our equipment is supplied with a CPCS trained operator.